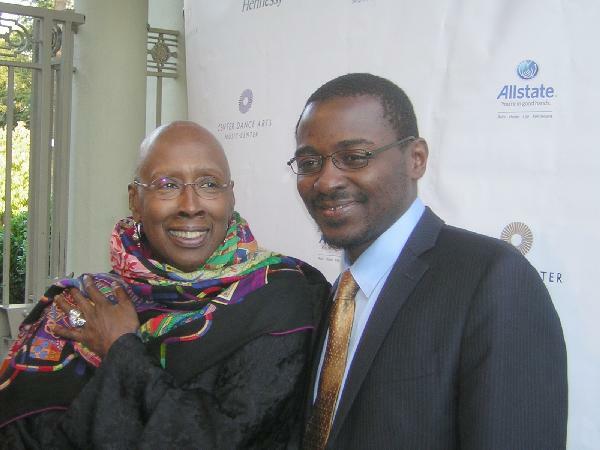 *Judith Jamison, who, after 21 years at the helm is stepping down as artistic director of the Alvin Ailey American Dance Theater, along with her artistic director designate, Robert Battle, recently attended a fundraising gala to celebrate the dance company. The Center Dance Arts (CDA) and the Music Center held the event at the historic home of CDA Chair Mattie McFadden-Lawson and Music Center Board of Directors member Michael A. Lawson. 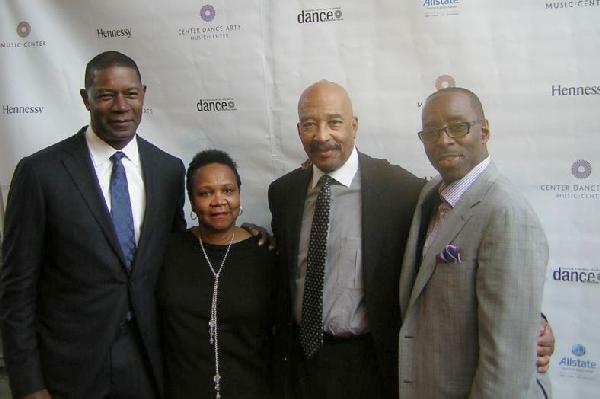 The gala, co-hosted by Dennis Haysbert, Debbie Allen and Norm Nixon, was sponsored by Allstate Insurance Company. “We are inspired by Judith Jamison and Robert Battle for their respective contributions to dance, a true art form that brings people from all backgrounds together. We thank Allstate and our many event sponsors,” said CDA Chair Mattie McFadden-Lawson. Celebrities on hand included Courtney Vance, Wren T. Brown (Ebony Repertory Theater), Sharon Leal, painter/sculptor Artis Lane, Wendy Raquel Robinson, dancer/choreographer Desmond Richardson and Loretta Devine. The Alvin Ailey® American Dance Theater is currently enjoying a run at the Music Center’s Dorothy Chandler Pavilion, through April 17. This year’s show celebrates five decades of “Revelations,” considered an American classic and Ailey’s most popular and revered dance. For the first time, “Revelations” is being presented each night alongside three other programs during all 10 performances. I caught up with Jamison to talk about her final season. Darlene Donloe: Why is this the right time for you to step down? Judith Jameson: I’ve been doing this for how long? When you see this man’s work [Robert Battle], you’ll understand I’m not stepping down, I’m making a lateral move so the future can go up. We’re about past, present and future. The company has always been about that. I’ve been dancing since I was six-years-old. I am 68 years old. Don’t even ask me, why now? Why not? I see a future and that man has the future in his hands. DD: What’s going to be your role now that you’re making a lateral move. JJ: You will find out when I cross that bridge. DD: You haven’t decided yet? JJ: Of course I have, but you’ll find out what I’m doing when I cross that bridge. Always knowing that I’m attached to Alvin’s spirit. That will always be there. You’ll see. It’s not retirement to me. You don’t retire in the art world. God gives you a gift. You retire when you’re dead. So, retirement simply means I’m going to move over this way a little bit and give room for this young man to take over and take this company places that you don’t even think it can go. JJ: Several things. I’m proud of a legacy that leaves a future. Some people clutch on to their stuff until it dies. This is about release and love and encouragement and making sure there is a future for this company. DD: Your dancers have a variety of shapes. JJ: Jamar Roberts – he is 6’4″ and he can dance along with my smallest one. That’s what’s beautiful. We’re not cookie cutter dancers and Alvin used to say. If you got talent – you are welcome. You stay healthy – you are welcome. You are excellent at what you do – you are welcome. You understand what it is from the spirit – you are welcome. DD: Are you going to miss it? JJ: When I cross the bridge, I’ll let you know. I don’t know. I’ve never done this before. So how am I supposed to tell you what it’s going to be like. But, I’m game. I’m fine. I love precipice. I always tell my dancers about that precipice. Don’t be afraid to step off. DD: So if I put you on the spot right now, could you dance a jig? JJ: No, and I never danced a jig. (laughter) So, you’re not going to get one now. I wasn’t doing it when I was dancing. DD: Mr. Robert Battles. Who decided he would take over? JJ: You’re looking at who decided. It’s total talent. I love that he reminds me of Alvin. There are certain things that he does. He loves dancers. He understands the legacy, past, present and future. The dancers love him. The crew loves him. The staff and board of directors all of them had to come on board. He was my choice – period! So, here we are two and a half years later from when I made my decision- here he is. Wait til you see his work. Then, there will be no question. Wait until you see his creativity and foresight and that innate intelligence of a creative artist – that he has – just wait. DD: Are you comfortable with the accolades and love that people pour on you? JJ: Yes, I’m accepting all the love I can get. And, don’t shut it down. Just because I’m making a lateral move, you still better be telling me how much you love me. I adore people that understand this process we call life. I’ve been able to dance through it and have people love what you do. And that’s about spirit. I know they love the long legs and the white dress and Revelations and all that. Which is brilliant. But, people are understanding the flow – and that started with Alvin. It actually started with my parents and grandparents. That flow has been going since the beginning of time and Robert is here to continue it. It’s all good. Alvin Ailey American Dance Theater, Music Center’s Dorothy Chandler Pavilion, 135 N. Grand Avenue, Los Angeles 90012; Fri., April 8 – Sun., April 17, 2011; $25-$105; musiccenter.org/events/dance.html; (213) 972-0711; Groups — 10 or more, call (213) 972-8555 or [email protected].